The U.S. Naval Station at Guantanamo holds the U.S. prison known as "Gitmo." President Obama said when he took office in 2009 that he wanted to close the prison, but 60 prisoners remain. Among the many unknowns hanging over this presidential transition: the fate of the U.S. military prison at Guantanamo Bay, Cuba. President Obama has sworn to close it; President-elect Trump wants to fill it up again. Obama has been promising the closure will happen since his second day in office in 2009. In February, he repeated that pledge one more time, saying, "I'm absolutely committed to closing the detention facility at Guantanamo." That same day, at a campaign rally in Sparks, Nevada, Donald Trump was promising the opposite. "This morning, I watched President Obama talking about Gitmo, right, Guantanamo Bay, which by the way, which by the way, we are keeping open. Which we are keeping open ... and we're gonna load it up with some bad dudes, believe me, we're gonna load it up." But, says Ben Wittes, editor-in-chief of the national security blog Lawfare, "You have to ask the question, with whom?" Because the U.S. is not fighting ground wars and taking prisoners like it once did, Wittes wonders just how Trump expects to load up Guantanamo with "bad dudes." "Trump's stated military strategy and ambition are so hard to figure out that it's not at all clear to me what the captive population that would be subject to being moved to Guantanamo [is], who they would be or where they would come from," he says. If it were up to Trump, those suspects might actually come from the United States. Asked last summer by the Miami Herald if Americans accused of terrorism should be tried by military commissions in Guantanamo, Trump endorsed such a policy. "I know that they want to try them in our regular court systems, and I don't like that at all. I don't like that at all. I would say they could be tried there, that'll be fine," he said. Under current law, American citizens cannot, in fact, be held in Guantanamo, much less tried there. Meanwhile, proponents of closing Guantanamo are demanding Obama fulfill his promise before Trump takes over. One online video counting down the days Obama has left features a new anthem with the refrain "Close Guantanamo, close Guantanamo." Of the 242 captives in Guantanamo when Obama took office, 60 remain, a third of them approved for release. But Rosa Brooks, a Georgetown University constitutional law professor and former Pentagon official, says that number could quickly be reduced to zero. "If President Obama wanted to close Guantanamo tomorrow," she says, "he could do it." Obama, she says, should simply ignore the ban Congress has imposed on sending any Guantanamo detainees to the U.S. for detention or trial. "If I were President Obama and I wanted to close Guantanamo, I would say, I regard this particular limitation as an unconstitutional infringement on my inherent powers as commander in chief. You know, thank you for your input, Congress, but I'm doin' it." Wittes, for his part, doubts that will happen. "Closing Guantanamo is clearly something the president very much wanted to do and he's never been willing to defy the acts of Congress on this, and I think that's because his administration actually doesn't believe it has the authority to do that. I don't think that's changed because Donald Trump has been elected." If Wittes is right, Trump stands to inherit a mostly empty Guantanamo prison. Whether he would really fill it up again remains an open question. 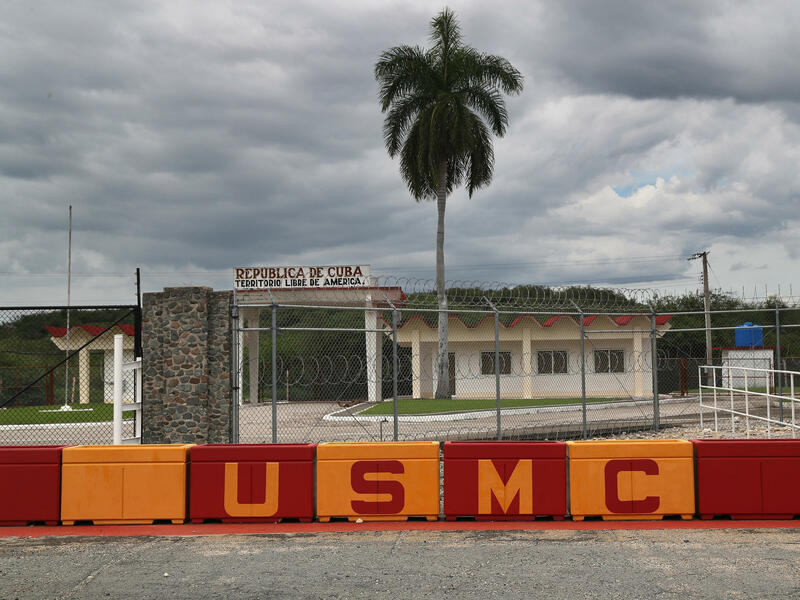 Among the many unknowns hanging over this presidential transition, the fate of the U.S. military prison at Guantanamo Bay, Cuba. President Obama has sworn to close it. President-elect Trump wants to fill it up again. NPR's David Welna reports. DAVID WELNA, BYLINE: He's been promising it will happen since his second day in office. And earlier this year, President Obama repeated that pledge one more time. PRESIDENT BARACK OBAMA: I'm absolutely committed to closing the detention facility at Guantanamo. WELNA: That same February day at a campaign rally in Sparks, Nev., Donald Trump was promising not to close Guantanamo. DONALD TRUMP: This morning, I watched President Obama talking about GTMO - right? - Guantanamo Bay. Which by the way, which by the way, we are keeping open, which we are keeping open. And we're going to load it up with some bad dudes, believe me. We're going to load it up. BEN WITTES: You have to ask the question of, with whom? WELNA: That's Ben Wittes, editor-in-chief of the national security blog "Lawfare." Because the U.S. is not fighting ground wars and taking prisoners like it once did, Wittes wonders just how Trump expects to load up Guantanamo with bad dudes. WITTES: Trump's stated military strategy and ambition are so hard to figure out, that it's not at all clear to me what the captive population that would be subject to being moved to Guantanamo, who they would be or where they would come from. WELNA: If it were up to Trump, those so-called bad dudes might actually come from the United States. Asked last summer by the Miami Herald if Americans accused of terrorism should be tried by military commissions in Guantanamo, Trump endorsed such a policy. TRUMP: I know that they want to them in our regular court systems. And I don't like that at all. I don't like that at all. I would say they could be tried there, that would be fine. WELNA: Under current law, American citizens cannot, in fact, be held in Guantanamo, much less tried there. Meanwhile, proponents of closing Guantanamo are demanding Obama fulfill his promise before Trump takes over. One online video counting down the days Obama has left features a new anthem. THE FOUR FATHERS: (Singing) Close Guantanamo. Close Guantanamo. WELNA: Of the 242 captives in Guantanamo when Obama took office, only 60 remain, a third of them approved for release. But a former Pentagon official says that number could quickly be reduced to zero. ROSA BROOKS: If President Obama wanted to close Guantanamo tomorrow, he could do it. WELNA: That's Georgetown University constitutional law professor Rosa Brooks. This former Pentagon legal adviser says Obama should simply ignore the ban Congress has imposed on sending any Guantanamo detainees to the U.S. for detention or trial. BROOKS: If I were President Obama and I wanted to close Guantanamo, I would say I regard this particular limitation as an unconstitutional infringement on my inherent powers as commander in chief. You know, thank you for your input Congress, but I'm doing it. WELNA: Ben Wittes, for his part, doubts that will happen. WITTES: Closing Guantanamo is clearly something the president very much wants to do. And he's never been willing to defy the acts of Congress on this. And I think that's because his administration actually doesn't believe it has the authority to do that. I don't think that's changed because Donald Trump has been elected. WELNA: If Wittes is right, Trump stands to inherit a nearly empty Guantanamo prison. Whether he'd really fill it up again is still an open question. David Welna, NPR News, Washington. Transcript provided by NPR, Copyright NPR.